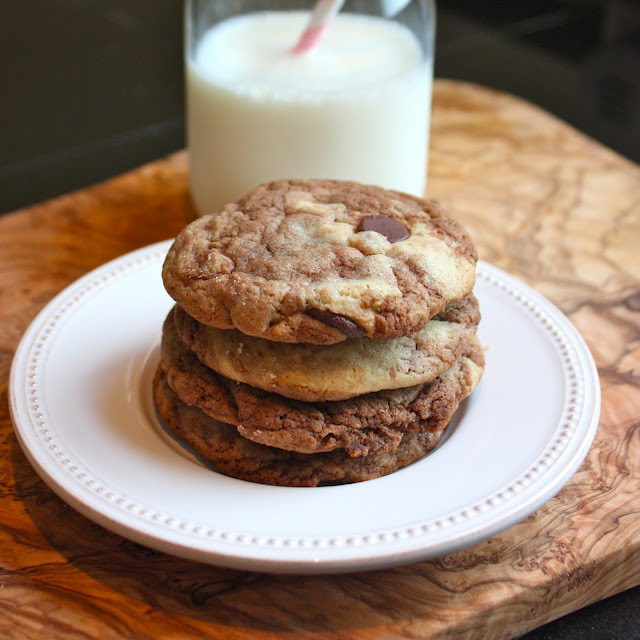 Would you believe me if I told you that you could make the fudgiest, butteriest, most delicious chocolate cookies on the planet without beating butter or chopping chocolate in less than 20 minutes? Probably not. But hopefully by the end of this post, you will. I met Bella and Mimi at ballet school in seventh grade. I have tons of great memories with them — gossiping in the locker room, running to Starbucks before barre, and making fun of our ancient Russian instructor behind his back. We used to play a game to see who could pay attention to him the longest (I always lost). The three of us haven’t been together in ages — the last time I saw Mimi I was an 8th grader! This was a really important occasion, and really important occasions call for really good cookies. Sadly, I didn’t have time to whip together my famous compost cookies and I couldn’t even pick up a box of Oreos for my Oreo stuffed chocolate chip cookies! Thanks to that magical, chocolaty spread, these cookies came together in a matter of seconds — no butter left? Used all those chocolate chips? No problem! I didn’t even need to touch my Kitchen Aid. By the time I finished doing my hair, they were already cooled and ready to eat! When I came home from lunch, my mom had eaten one of the extra cookies that I left on the counter. She said that they were out-of-this-world delicious, and one of the best cookies I’ve ever made. Everyone should know this recipe — because you never know when the next cookie catastrophe will strike! combined. Place dough in freezer for 10 minutes. carefully transfer to a wire rack. Generously sprinkle with sea salt. My friend Veda and I always have “midnight baking sessions.” Something amazing happens when you mix sleep-deprivation, buttercream, a Kitchen-Aid mixer, and an ungodly amount of Mike and Ikes. Sounds crazy, but there is something to it — this is how the best cake I ever ate was created. We always start our “midnight baking session” with a TON of recipes. This time, we discussed everything from chocolate covered brownie ice cream sandwiches to krispie kreme copycats. We knew we wanted to make cookies — and were debating between two great recipes. Should we make the oatmeal cream sandwich cookies? 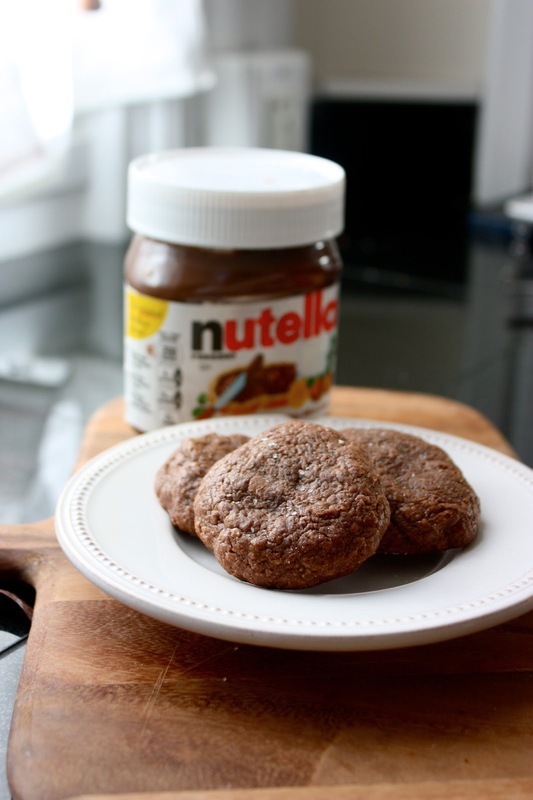 Or the (perfected) Nutella chocolate chip? 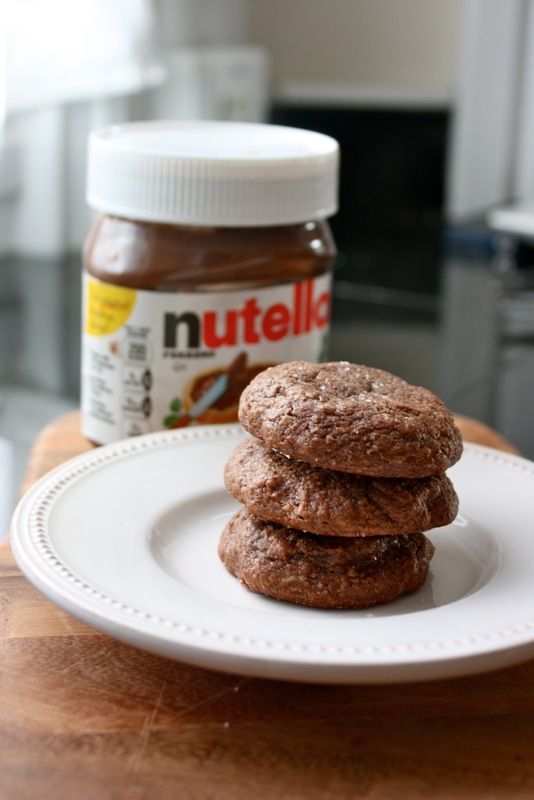 The Nutella cookies sounded tastier. But aren’t two cookies always better than one? Especially when they are sandwiched together with coconut flavored mascarpone cheese? AGHHH TOO MANY DECISIONS! Preheat oven to 375 degrees F. Line a couple baking sheets with parchment paper. the remaining 1/4 cup of nutella, mixing just so it is streaked throughout the dough, taking care not to over-mix. The recipe that I’m sharing with you today is on the verge of magical. 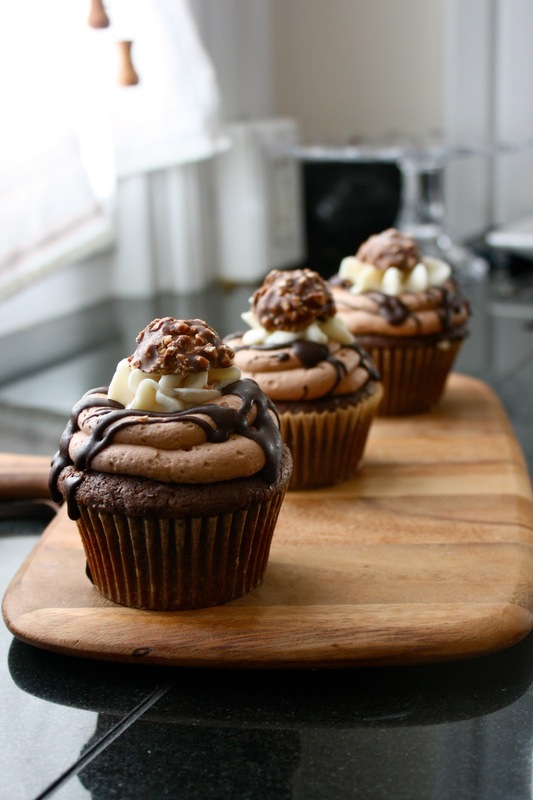 It’s delicious, chocolatey, hazelnut-y… oh, and did I mention its healthy? 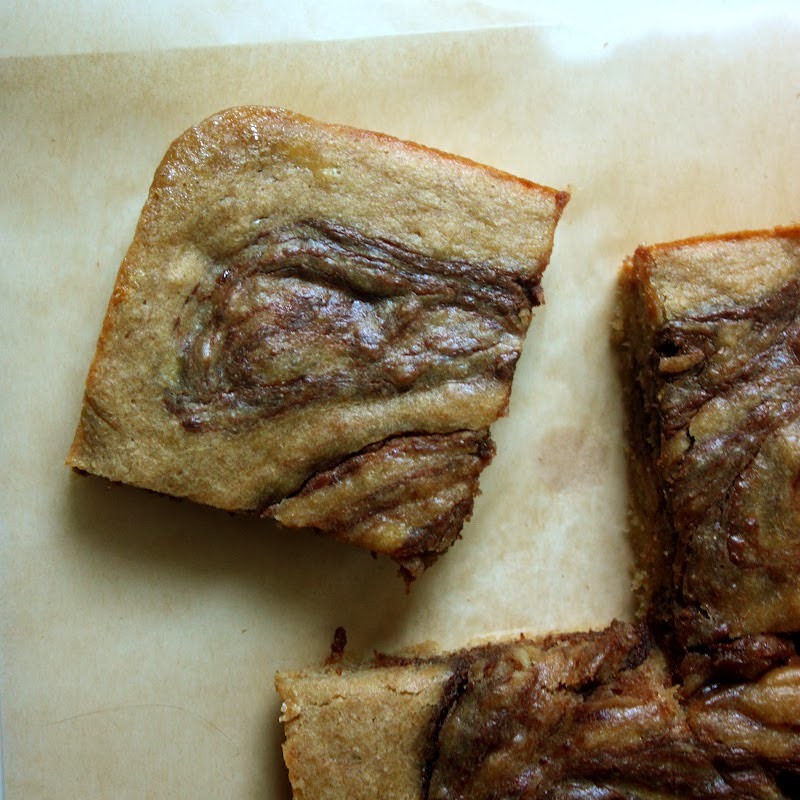 Yes this Nutella swirl banana snack cake tastes decadent… and is actually pretty good for you. 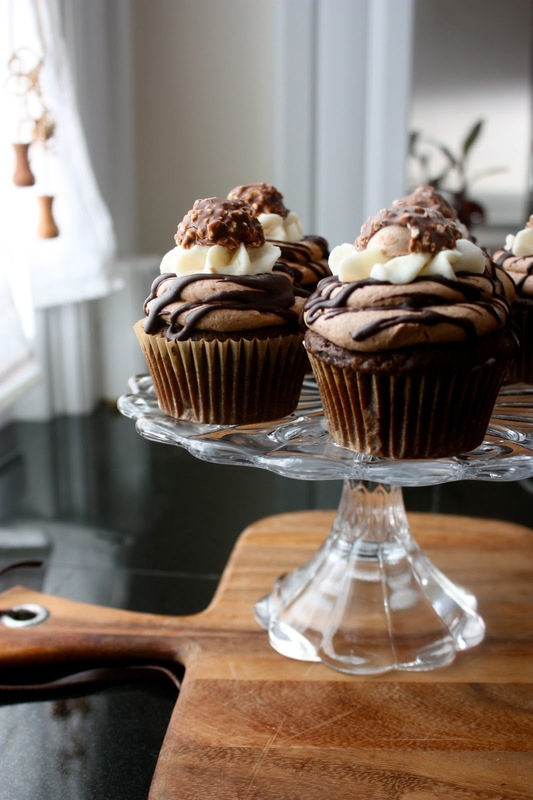 Shall we start with the decadent part? The chocolate banana combination is everywhere — take Starbucks’ ever-popular banana chocolate chip coffee cake. What could be better than bananas and chocolate? bananas and nutella. The nutty spread couples perfectly with the sweet banana flavor, and along with a pinch of instant coffee, it takes this plane-jane banana cake to a whole new crazy level. Now for the healthy part. What’s to argue with fruit, a little bit of butter sugar for good measure (cause this is a cake after all), whole wheat flour, and healthy Nutella (I used the reduced sugar version from Justin’s Nut Butter). This cake is the prefect snack and the perfect excuse to eat cake for breakfast! In a large bowl, whisk egg and brown sugar until smooth. Add in vanilla extract, instant coffee and mashed bananas, mixing until combined. Add in flour, baking powder, cinnamon and salt, mixing until the batter comes together. Add in melted butter and mix until evenly distributed. Pour into baking pan. 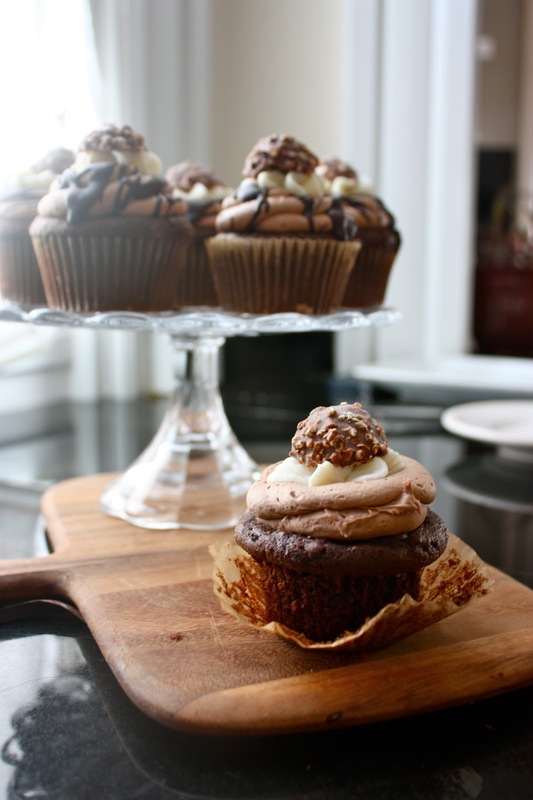 Add heaping tablespoons of Nutella (about 4), and gently swirl into the batter. Bake for 20 minutes, or until edges are golden.